I love our cats dearly and wouldn’t trade them for anything. It’s very rewarding to own cats, especially ours as I often think they act more like dogs than cats. Before I start complaining, as a dog lover as well, it is so nice that cats don’t need to be taken for walks or let out at all hours to do their business. However, my least favorite chore as a cat owner, by far, is keeping the litter boxes scooped and smelling their best. It’s often a stinky, smelly, dirty and downright icky job. And the worst part is that even when you scoop the litter box, it can still smell down right grody. Let’s just say that manly man Mr. Savvy happily passes the job along to me. 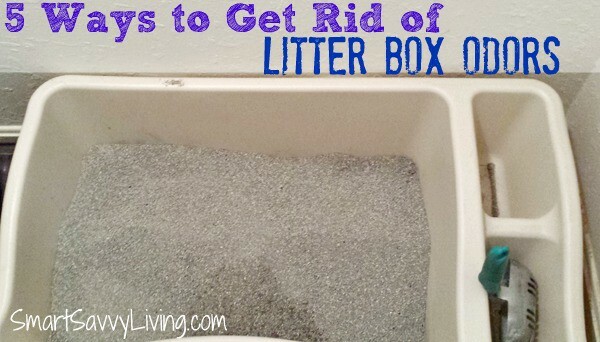 That’s why I wanted to share these 5 tried and true ways to get rid of litter box odors! 1. Choose a smart litter box location and have more than one. Unless you have really small living arrangements, try to keep the litter boxes away from the highly lived in places in your home such as offices and living rooms. You also don’t want the box to be placed in areas you may rarely frequent such as the basement (or you may start slipping at tip #2 – I know I sure did!). I like to put them in areas we go by often but don’t constantly have our noses in, such as inside or close to the bathrooms. I recommend against closets and small spaces as they can concentrate the odors and make them more offensive. Seeing the box regularly also helps me scoop more often. The general rule for number of litter boxes is # of cats + 1. So, if you have 2 cats, you’d want at least 3 litter boxes. The more boxes you have around the house, the less concentrated the odor will be in one area. Where we’re currently living, we don’t have space for several litter boxes, so we opted to use less litter boxes, but they are pretty huge as you can see in the picture above. It seems to do an equally well job. 2. Scoop the litter box regularly. It’s said that cats use the scent of their waste as part of laying claim to their territory. So, you don’t want to be awaiting with scoop in hand every time kitty jumps into the box. However, to keep litter box odors at a minimum, you really want to scoop the litter box regularly. Every other day for 1 – 2 cats to daily for multiple cats should be optimal depending on the number of boxes you have in your home. Always add some fresh litter after scooping as well. 3. Regularly clean the litter box and surrounding area. Scooping the box is great, but the litter box itself also needs to regularly be cleaned. Over time, urine can leak down to the bottom and sides of the box and get stuck, no matter how well you try to scoop. Plus, even with clumping litter, it gets soiled after a while. So, every 2 weeks to 1 month, I like to completely empty out the box of litter and use a mild detergent and warm water for a thorough cleaning. I have always been told to not use bleach unless it’s thoroughly watered down as it can actually cause urine stains and odors to set, but I don’t know how much truth there is to that. Be sure to clean the scoop, too. Also, clean the area around where the litter box is. If your cats love digging like mine do, they likely can fling litter a few feet around the box, under the box, in the corners of the room, etc. Especially if you have male cats, there may be some slight spraying on the walls (ick, right?) as well. If you have carpet, I’d also suggest giving it a wash at least once a year, too. You can use a black light (make sure the room is dark) to see where exactly cat urine is ending up. 4. Invest in products that help litter box odors. Sometimes you do everything right, but there’s still some odor left behind which can be remedied by using other products. While I personally don’t like using them as I forget to scoop because I can’t see inside, many cat owners like covered litter boxes, which can come with charcoal filters to absorb odors. I instead opt for the charcoal filters you can plug into an outlet. I also like to add a bit of baking soda to the litter to absorb some smells. There are also some specialized cat odor sprays you can invest in. Remember to never use scents like citrus, as cats do not like them and can even be deterred from using the litter box if they smell them. 5. Use a quality cat litter. Using a quality cat litter that your cat likes is one of the most important factors in combating smelly litter boxes, in my opinion. I’ve always used scoopable cat litter and have found they work best for smells, especially with multiple cats. We tried the non-scoopable litter once to save some money. Note that I mention we only tried it once. We, and I think our cats do too, much prefer a clumping litter as it seems to absorb smells better. Plus, it’s SO much easier to scoop, especially when you have multiple cats. Using the Tidy Cat Breeze system has really cut back on odor and litter tracking. The only downside is the price. You are so right about using quality cat liter. The cheap stuff really does smell!